Die Welt der chemischen Vorgänge gleicht einer Bühne, auf welcher sich in unablässiger Aufeinanderfolge Scene um Scene abspielt. Die handelnden Personen auf ihr sind die Elemente. The world of chemical reactions is like a stage, on which scene after scene is ceaselessly played. The actors on it are the elements. Original German quote in Mary Elvira Weeks, The Discovery of the Elements (1934), 2, citing Winkler, 'Ueber die Entdeckung neuer Elemente im Verlaufe der letzten fünfundzwanzig Jahre," Ber. (Jan 1897), 30, 13. Translation in Mary Elvira Weeks and Henry M. Leicester (ed. )The Discovery of the Elements (6th ed. 1956), 3. Commonly seen paraphrase. Einstein expressed this idea at different times. See variations on this website on the Albert Einstein Quotes page. La determination de la relation & de la dépendance mutuelle de ces données dans certains cas particuliers, doit être le premier but du Physicien; & pour cet effet, il falloit one mesure exacte qui indiquât d’une manière invariable & égale dans tous les lieux de la terre, le degré de l'électricité au moyen duquel les expéiences ont été faites… Aussi, l'histoire de l'électricité prouve une vérité suffisamment reconnue; c'est que le Physicien sans mesure ne fait que jouer, & qu'il ne diffère en cela des enfans, que par la nature de son jeu & la construction de ses jouets. 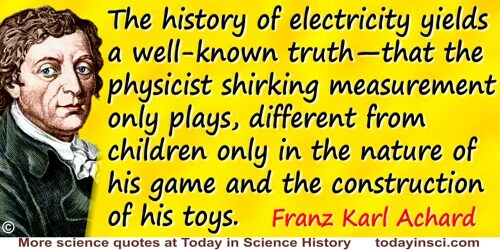 The determination of the relationship and mutual dependence of the facts in particular cases must be the first goal of the Physicist; and for this purpose he requires that an exact measurement may be taken in an equally invariable manner anywhere in the world… Also, the history of electricity yields a well-known truth—that the physicist shirking measurement only plays, different from children only in the nature of his game and the construction of his toys. 'Mémoire sur la mesure de force de l'électricité', Journal de Physique (1782), 21, 191. English version by Google Translate tweaked by Webmaster. A mathematician’s work is mostly a tangle of guesswork, analogy, wishful thinking and frustration, and proof, far from being the core of discovery, is more often than not a way of making sure that our minds are not playing tricks. In Rota's 'Introduction' written (1980) to preface Philip J. Davis and Reuben Hersh, The Mathematical Experience (1981, 2012), xxii. A science cannot be played with. If an hypothesis is advanced that obviously brings into direct sequence of cause and effect all the phenomena of human history, we must accept it, and if we accept it, we must teach it. In The Degradation of the Democratic Dogma (1919), 131. All knowledge and understanding of the Universe was no more than playing with stones and shells on the seashore of the vast imponderable ocean of truth. Astrology fosters astronomy. Mankind plays its way up. The original German “Astrologie fördert Astronomie. Die Menschen spielen sich in die Höhe,” appears in Ernst Volkmann (ed. ), Aphorismen: Eine Sammlung aus Lichtenbergs Gedankenbüchern (1944), 85. However, so far, this is the only German source found by Webmaster. English as gived in H.W. Auden, The Faber Book of Aphorisms (1962), 261. Bacon himself was very ignorant of all that had been done by mathematics; and, strange to say, he especially objected to astronomy being handed over to the mathematicians. Leverrier and Adams, calculating an unknown planet into a visible existence by enormous heaps of algebra, furnish the last comment of note on this specimen of the goodness of Bacon’s view… . Mathematics was beginning to be the great instrument of exact inquiry: Bacon threw the science aside, from ignorance, just at the time when his enormous sagacity, applied to knowledge, would have made him see the part it was to play. If Newton had taken Bacon for his master, not he, but somebody else, would have been Newton. In Budget of Paradoxes (1872), 53-54. But weightier still are the contentment which comes from work well done, the sense of the value of science for its own sake, insatiable curiosity, and, above all, the pleasure of masterly performance and of the chase. These are the effective forces which move the scientist. 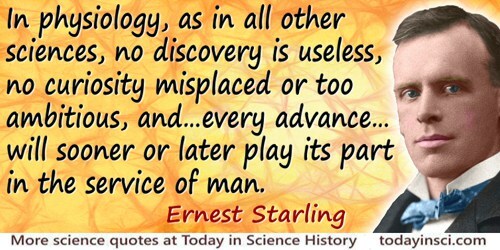 The first condition for the progress of science is to bring them into play. But why, some say, the moon? Why choose this as our goal? And they may well ask; why climb the highest mountain? Why, 35 years ago, fly the Atlantic? Why does Rice play Texas? Chance... in the accommodation peculiar to sensorimotor intelligence, plays the same role as in scientific discovery. It is only useful to the genius and its revelations remain meaningless to the unskilled. The Origin of Intelligence in the Child (1936), trans. Margaret Cook (1953), 303. From The Republic 7 536e-537a, as translated by Paul Shorey (1930). Does it mean, if you don’t understand something, and the community of physicists don’t understand it, that means God did it? Is that how you want to play this game? Because if it is, here’s a list of the things in the past that the physicists—at the time—didn’t understand … [but now we do understand.] If that’s how you want to invoke your evidence for God, then God is an ever-receding pocket of scientific ignorance, that’s getting smaller and smaller and smaller, as time moves on. So just be ready for that to happen, if that’s how you want to come at the problem. That’s simply the “God of the Gaps” argument that’s been around for ever. From interview, The Science Studio video series of The Science Network website, episode 'The Moon, the Tides and why Neil DeGrasse Tyson is Colbert’s God' (20 Jan 2011), time 26:58-27:55. Einstein never accepted quantum mechanics because of this element of chance and uncertainty. He said: God does not play dice. It seems that Einstein was doubly wrong. The quantum effects of black holes suggests that not only does God play dice, He sometimes throws them where they cannot be seen. Einstein was wrong when he said, 'God does not play dice'. Consideration of black holes suggests, not only that God does play dice, but that he sometimes confuses us by throwing them where they can't be seen. In The Nature Of Space And Time (1996, 2010), 26. Erasmus Darwin held that every so often you should try a damn-fool experiment. He played the trombone to his tulips. This particular result was, in fact, negative. In 'The Mathematician’s Art of Work' (1967), collected in Béla Bollobás (ed. ), Littlewood’s Miscellany (1986), 194. Webmaster has looked for a primary source to verify this statement and so far has found none. Can you help? Every phenomenon, however trifling it be, has a cause, and a mind infinitely powerful, and infinitely well-informed concerning the laws of nature could have foreseen it from the beginning of the ages. If a being with such a mind existed, we could play no game of chance with him; we should always lose. Science and Method (1908), trans. Francis Maitland (1914), 65. Five centuries ago the printing press sparked a radical reshaping of the nature of education. By bringing a master’s words to those who could not hear a master’s voice, the technology of printing dissolved the notion that education must be reserved for those with the means to hire personal tutors. Today we are approaching a new technological revolution, one whose impact on education may be as far-reaching as that of the printing press: the emergence of powerful computers that are sufficiently inexpensive to be used by students for learning, play and exploration. It is our hope that these powerful but simple tools for creating and exploring richly interactive environments will dissolve the barriers to the production of knowledge as the printing press dissolved the barriers to its transmission. As co-author with A.A. diSessa, from 'Preface', Turtle Geometry: The Computer as a Medium for Exploring Mathematics (1986), xiii. God is a child; and when he began to play, he cultivated mathematics. It is the most godly of man’s games. Said by the fictional character, mathematics teacher, Professor Hirt, in Das Blinde Spiel (The Blind Game, 1954), 253. As translated in an epigraph, Stanley Gudder, A Mathematical Journey (1976), 269. From the original German, “Gott ist ein Kind, und als er zu spielen begann, trieb er Mathematik. Die Mathematik ist göttlichste Spielerei unter den Menschen”, as quoted in Herbert Meschkowski, Hundert Jahre Mengenlehre (1973), 119. God is dead not because He doesn’t exist, but because we live, play, procreate, govern, and die as though He doesn’t. God not only plays dice. He also sometimes throws the dice where they cannot be seen. In 'News and Views: The Breakdown of Physics? ', Nature (2 Oct 1975), 257, 362. [A reference to Albert Einstein’s earlier quote on dice]. God plays dice with the universe, but they’re loaded dice. And the main objective of physics now is to find out by what rules were they loaded and how can we use them for our own ends. Quoted in James Gleick, Chaos: Making a New Science (1987), 314. Have fun: You only go through life once, but if you play it right once is enough. First reported in Joseph Spence, Anecdotes, Observations and Characters, of Books and Men (1820), Vol. 1 of 1966 edn, sect. 1259, p. 462. Purported to have been addressed by Newton in the final year of his life (1727) to Chevalier Andrew Michael Ramsey (which conflicts with the Dictionary of National Biography article giving that he was in France at the time). 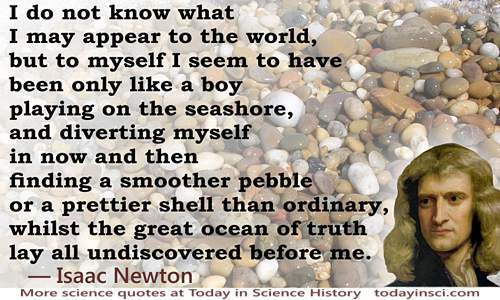 Quoted in David Brewster, Memoirs of the Life, Writings, and Discoveries of Sir Isaac Newton (1855), Vol. 2, 407. I figure you have the same chance of winning the lottery whether you play or not. I had a Meccano set with which I “played” endlessly. Meccano which was invented by Frank Hornby around 1900, is called Erector Set in the US. New toys (mainly Lego) have led to the extinction of Meccano and this has been a major disaster as far as the education of our young engineers and scientists is concerned. Lego is a technically trivial plaything and kids love it partly because it is so simple and partly because it is seductively coloured. However it is only a toy, whereas Meccano is a real engineering kit and it teaches one skill which I consider to be the most important that anyone can acquire: This is the sensitive touch needed to thread a nut on a bolt and tighten them with a screwdriver and spanner just enough that they stay locked, but not so tightly that the thread is stripped or they cannot be unscrewed. On those occasions (usually during a party at your house) when the handbasin tap is closed so tightly that you cannot turn it back on, you know the last person to use the washroom never had a Meccano set. Nobel laureate autobiography in Les Prix Nobel/Nobel Lectures 1996 (1997), 189. I play a tiresome game. As quoted on the website mcescher.com, without citation. 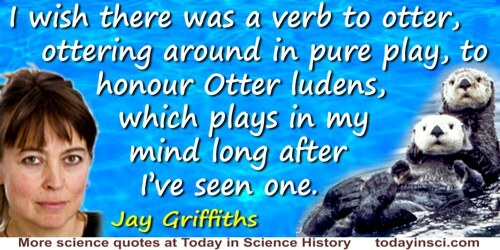 I wish there was a verb to otter, ottering around in pure play, to honour Otter ludens, which plays in my mind long after I’ve seen one. 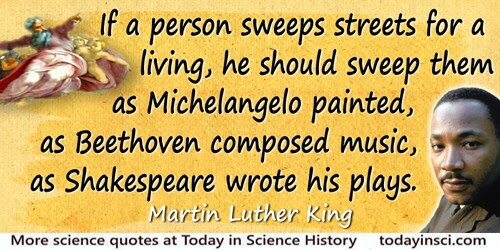 If a person sweeps streets for a living, he should sweep them as Michelangelo painted, as Beethoven composed music, as Shakespeare wrote his plays. As quoted, without citation, in Patricia J. Raskin, Pathfinding: Seven Principles for Positive Living (2002), 102. Imagine that … the world is something like a great chess game being played by the gods, and we are observers of the game. … If we watch long enough, we may eventually catch on to a few of the rules…. However, we might not be able to understand why a particular move is made in the game, merely because it is too complicated and our minds are limited…. We must limit ourselves to the more basic question of the rules of the game. If we know the rules, we consider that we “understand” the world. In 'Basic Physics', The Feynman Lectures on Physics (1964, 2013), Vol. 1, 2-1. In an unenlightened society some people are forced to play degrading social roles; in an enlightened society, everyone is. In The Decline and Fall of Science (1976), 5. Inspiration in the field of science by no means plays any greater role, as academic conceit fancies, than it does in the field of mastering problems of practical life by a modern entrepreneur. On the other hand, and this also is often misconstrued, inspiration plays no less a role in science than it does in the realm of art. It is hard to sneak a look at God’s cards. But that he would choose to play dice with the world … is something I cannot believe for a single moment. It is the facts that matter, not the proofs. 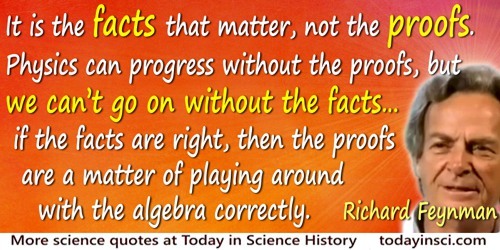 Physics can progress without the proofs, but we can’t go on without the facts … if the facts are right, then the proofs are a matter of playing around with the algebra correctly. Feynman Lectures on Gravitation, edited by Brian Hatfield (2002), 137. Quoted, without citation, as a column filler, in New York State Department of Mental Hygiene, Mental Hygiene News (1949), Volumes 20-26, 20. Webmaster has so far been unable to find a primary source, so please contact if you know the primary source. Many professional mathematicians regard their work as a form of play, in the same way professional golfers or basketball stars might. In his final retrospective article, 'A Quarter-Century of Recreational Mathematics', Scientific American (Aug 1998). Mathematicians pretend to count by means of a system supposed to satisfy the so-called Peano axioms. In fact, the piano has only 88 keys; hence, anyone counting with these axioms is soon played out. In Mathematics Made Difficult (1971). As quoted in Michael Stueben and Diane Sandford, Twenty Years Before the Blackboard (1998), 131. Given as narrative, without quotation marks, in Eric Temple Bell, Mathematics, Queen and Servant of Science (1951, 1961), 21. Mssr. Fermat—what have you done? Which are nothing but goofs! Could it be that your statement’s an erudite spoof? That you’ve played on us folks? But then you’re really not known for your practical jokes. When n was an integer greater than two? That same proof…are we blind? You must be reproved, for I’m losing my mind. In 'Fermat's Last Theorem', Mathematics Magazine (Apr 1986), 59, No. 2, 76. How then shall mathematical concepts be judged? They shall not be judged. Mathematics is the supreme arbiter. From its decisions there is no appeal. We cannot change the rules of the game, we cannot ascertain whether the game is fair. We can only study the player at his game; not, however, with the detached attitude of a bystander, for we are watching our own minds at play. In Number: The Language of Science; a Critical Survey Written for the Cultured Non-Mathematician (1937), 244-245. On the way back [from the moon] we had an EVA [extra-vehicular activity, or spacewalk] I had a chance to look around while I was outside and Earth was off to the right, 180,000 miles away, a little thin sliver of blue and white like a new moon surrounded by this blackness of space. Back over my left shoulder was almost a full moon. I didn’t feel like I was a participant. It was like sitting in the last row of the balcony, looking down at all of that play going on down there. I had that insignificant feeling of the immensity of this, God’s creation. Pauling was shocked by the freedom with which the X-ray crystallographers of the time, including particularly Astbury, played with the intimate chemical structure of their models. They seemed to think that if the atoms were arranged in the right order and about the right distance apart, that was all that mattered, that no further restrictions need to be put on them. Quoted by John Law in 'The Case of X-ray Protein Crystallography', collected in Gerard Lemaine (ed. ), Perspectives on the Emergence of Scientific Disciplines, 1976, 140. People move out to the suburbs to make their lives and seek their dream, only too often to find that they are playing leapfrog with bulldozers, longing for the meadow that used to be the children’s paradise at the end of the street. As quoted in Time (1999), 153, 159. Also in Lecture (2 Dec 1998) to 1998 Democratic Leadership Council Annual Conference, Washington, D.C., collected in Joseph Kaufmann (ed. ), The World According To Al Gore: An A-To-Z Compilation Of His Opinions, Positions and Public Statements (1999), 282. Pure mathematics and physics are becoming ever more closely connected, though their methods remain different. One may describe the situation by saying that the mathematician plays a game in which he himself invents the rules while the while the physicist plays a game in which the rules are provided by Nature, but as time goes on it becomes increasingly evident that the rules which the mathematician finds interesting are the same as those which Nature has chosen. … Possibly, the two subjects will ultimately unify, every branch of pure mathematics then having its physical application, its importance in physics being proportional to its interest in mathematics. From Lecture delivered on presentation of the James Scott prize, (6 Feb 1939), 'The Relation Between Mathematics And Physics', printed in Proceedings of the Royal Society of Edinburgh (1938-1939), 59, Part 2, 124. Quantum mechanics is very imposing. … I, at any rate, am convinced that He [God] is not playing at dice. In letter (4 Dec 1926) to Max Born. From the original German, “Die Quantenmechanik ist sehr achtung-gebietend. … Jedenfalls bin ich überzeugt, daß der nicht würfelt.” English version as in Albert Einstein, Max Born, Hedwig Born and Irene Born (trans. ), The Born-Einstein Letters (1971). Science is a game we play with God, to find out what his rules are. Science is a great game. It is inspiring and refreshing. The playing field is the universe itself. In 'Humanistic Scientist: Isidor Isaac Rabi', New York Times (28 Oct 1964), 38. 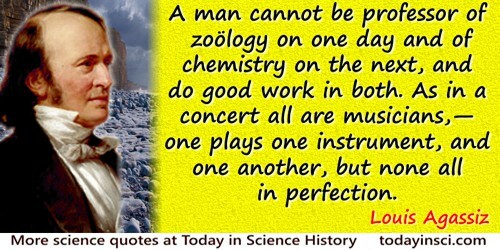 Science progresses by a series of combinations in which chance plays not the least role. Its life is rough and resembles that of minerals which grow by juxtaposition [accretion]. This applies not only to science such as it emerges [results] from the work of a series of scientists, but also to the particular research of each one of them. In vain would analysts dissimulate: (however abstract it may be, analysis is no more our power than that of others); they do not deduce, they combine, they compare: (it must be sought out, sounded out, solicited.) When they arrive at the truth it is by cannoning from one side to another that they come across it. English translation from manuscript, in Évariste Galois and Peter M. Neumann, 'Dossier 12: On the progress of pure analysis', The Mathematical Writings of Évariste Galois (2011), 263. A transcription of the original French is on page 262. In the following quote from that page, indicated deletions are omitted, and Webmaster uses parentheses to enclose indications of insertions above the original written line. “La science progresse par une série de combinaisons où le hazard ne joue pas le moindre rôle; sa vie est brute et ressemble à celle des minéraux qui croissent par juxtà position. Cela s’applique non seulement à la science telle qu’elle résulte des travaux d’une série de savants, mais aussi aux recherches particulières à chacun d’eux. En vain les analystes voudraient-ils se le dissimuler: (toute immatérielle qu’elle wst analyse n’est pas pas plus en notre pouvoir que des autres); ils ne déduisent pas, ils combinent, ils comparent: (il faut l’epier, la sonder, la solliciter) quand ils arrivent à la vérité, c’est en heurtant de côté et d’autre qu’il y sont tombés.” Webmaster corrected from typo “put” to “but” in the English text. 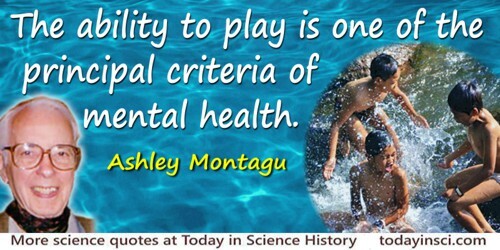 The ability to play is one of the principal criteria of mental health. In 'Childhood’s Promises', Television & Children (1980), 3, No. 3, 17. Concluding remarks to his mathematical proof, with certain assumptions, that the best betting strategy for “Gambler’s Ruin” would be to always make his largest stake on his first play. In 'Gambler’s Ruin', Annals of Mathematics (Jul 1909), 2nd Series, 10, No. 4, 189. This is also seen, without primary source, quoted as “It is true that a man who does this is a fool. I have only proved that a man who does anything else is an even bigger fool,” in Harold Eves, Return to Mathematical Circles (1988), 39. The best thing about being a statistician is that you get to play in everyone’s backyard. The first man of science was he who looked into a thing, not to learn whether it furnished him with food, or shelter, or weapons, or tools, armaments, or playwiths but who sought to know it for the gratification of knowing. The history of a species, or any natural phenomenon that requires unbroken continuity in a world of trouble, works like a batting streak. All are games of a gambler playing with a limited stake against a house with infinite resources. The gambler must eventually go bust. His aim can only be to stick around as long as possible, to have some fun while he’s at it, and, if he happens to be a moral agent as well, to worry about staying the course with honor. In Bully for Brontosaurus: Reflections in Natural History (1991), 471-472. The most wonderful mystery of life may well be the means by which it created so much diversity from so little physical matter. The biosphere, all organisms combined, makes up only about one part in ten billion of the earth's mass. … Yet life has divided into millions of species, the fundamental units, each playing a unique role in relation to the whole. In 'The Most Fundamental Unit', The Diversity of Life (1992), 35. The understanding of atomic physics is child’s play, compared with the understanding of child’s play. As quoted in Alan L. Mackay, A Dictionary of Scientific Quotations (1991), 144. Need primary source; can you help? There are children playing in the street who could solve some of my top problems in physics, because they have modes of sensory perception that I lost long ago. This is often the way it is in physics—our mistake is not that we take our theories too seriously, but that we do not take them seriously enough. It is always hard to realize that these numbers and equations we play with at our desks have something to do with the real world. In The First Three Minutes: A Modern View of the Origin of the Universe (1977, Rev. ed. 1993), 131-132. Thus God himself was too kind to remain idle, and began to play the game of signatures, signing his likeness into the world; therefore I chance to think that all nature and the graceful sky are symbolized in the art of geometry. In Tertius Interveniens (1610), as quoted in Freeman Dyson, 'Mathematics in the Physical Sciences', Scientific American (Sep 1964), 211, No. 3, 129. Unchangeable, save to thy wild waves play. In 'Childe Harold’s Pilgrimage', The Complete Works of Lord Byron: Reprinted from the Last London Edition (1841), CLXXXII, 146. We are going through the body-snatching phase right now, and there are all these Burke and Hare attitudes towards geneticists-that they are playing God and that DNA is sacred. No, it’s not. It’s no more sacred than your toenails. Basically, we are not going to make long-term medical progress without understanding how the genes work. Quoted by Sean O’Hagan, in 'End of sperm report', The Observer (14 Sep 2002). We believe in the possibility of a theory which is able to give a complete description of reality, the laws of which establish relations between the things themselves and not merely between their probabilities ... God does not play dice. We can’t all be Einstein (because we don’t all play the violin). At the very least we need a sort of street-smart science: the ability to recognize evidence gather it assess it and act on it. In Light Elements: Essays in Science from Gravity to Levity (1991), 14. We do not cease to play because we grow old. We grow old because we cease to play. When the number of factors coming into play in a phenomenological complex is too large, scientific method in most cases fails us. One need only think of the weather, in which case prediction even for a few days ahead is impossible. Nevertheless no one doubts that we are confronted with a causal connection whose causal components are in the main known to us. Out of My Later Years (1995), 28. Would it (the world) otherwise (without consciousness) have remained a play before empty benches, not existing for anybody, thus quite properly not existing? You will be astonished when I tell you what this curious play of carbon amounts to. A candle will burn some four, five, six, or seven hours. What, then, must be the daily amount of carbon going up into the air in the way of carbonic acid! ... Then what becomes of it? Wonderful is it to find that the change produced by respiration ... is the very life and support of plants and vegetables that grow upon the surface of the earth. In A Course of Six Lectures on the Chemical History of a Candle (1861), 117. You [the Mensheviks] are pitiful isolated individuals; you are bankrupts; your role is played out. Go where you belong from now on—into the dustbin of history! In History of the Russian Revolution (1933), Vol. 3, Chap. 10. [Janos] Bolyai when in garrison with cavalry officers, was provoked by thirteen of them and accepted all their challenges on condition that he be permitted after each duel to play a bit on his violin. He came out victor from his thirteen duels, leaving his thirteen adversaries on the square. In János Bolyai, Science Absolute of Space, translated from the Latin by George Bruce Halsted (1896), Translator's Introduction, xxix. [Science] is sort of a game. Any fundamental advances in our field are made by looking at it with the smile of a child who plays a game. As quoted in Lewis Wolpert and Alison Richards (eds. ), Passionate Minds: The Inner World of Scientists (1997), 4.